A welder is pictured who lost his left arm while in the service at Pearl Harbor. 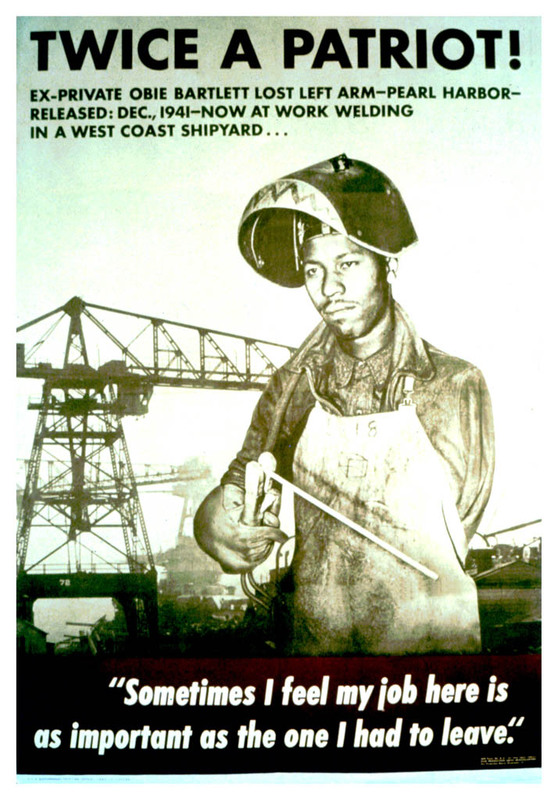 Poster Text: TWICE A PATRIOT / EX-PRIVATE OBIE BARTLETT LOST LEFT ARM - PEARL HARBOR - / RELEASED DEC., 1941 - NOW AT WORK WELDING / IN A WEST COAST SHIPYARD . . . / SOMETIMES I FEEL MY JOB HERE IS / AS IMPORTANT AS THE ONE I HAD TO LEAVE.